I continue my gripe with writing on this thing. 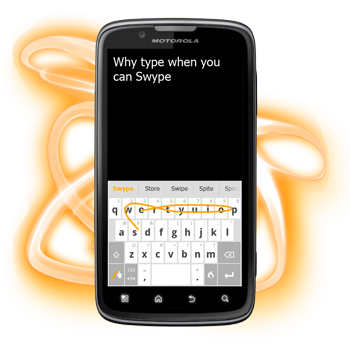 My friend suggested I try Swype. What a joke. Maybe I missed the memo, but it just seems like one more thing to ruin the English language. Hell I can barely even write in cursive anymore. I can’t imagine what Swype would do to my handwriting. In the words of a late great 90s poet, I reject your deposit.Finally listened to some music on it. Eh, nothing spectacular. Watched a little of the last season of Dexter. Amazing how convenient this little kick stand is. Video quality was ok. I think it was more so the video than the device that made it sub-par. In my quest to give Andy a fair shake, I am determined to learn all I can. First I learned from a friend I can hold down the HOME key to see the last apps I opened. Something so small, but something I utilize heavy as I toggle between games, apps, etc. One thing I have yet to locate is a stock notepad type app. Of course there are numerous ones on Google Play like EverNote & ColorNote Notepad, but I just wanted a basic program. I use my notepad on Izzy for EVERYTHING. Not a big deal I suppose. I learned the Photon has no ability to do screen captures. I have to download an app for that. Still searching. I showed my friend the McDowell’s post. He suggested I talk to my phone like he does to his Galaxy. I Google’d to see Andrea is capable of, and tried the Google Talk command. I found a video for Google Talk vs Siri. Appeared from the video Google Talk had an advantage with speed and accuracy. As I sat at my desk at work, anticipation grew. I couldn’t wait to get in my car and test it out. The end of the work day finally arrives. I get in the car and tried my wordplay with her. Eh again. She didn’t really react the way I wanted. Maybe I need to lower my expectations. I guess I was impressed a little bit at how it captured my words verbatim because I tend to talk low. Yet, the commands were not as robust as I wanted. I called home, it dialed as I stated, but wouldn’t recognize the speaker command. Oh well. Tonight my rooting adventure will begin. Going to see how deep she will let me go.